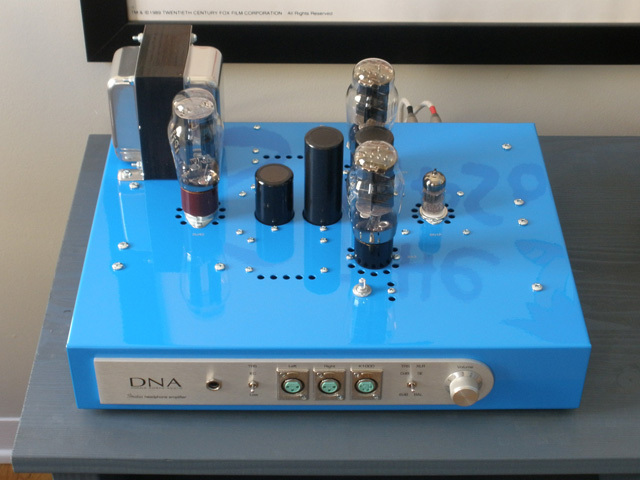 The DNA Stratus vacuum tube headphone amplifier is specially created to drive all dynamic headphones with the life-like fidelity uniquely provided by the 2A3 directly heated triode. The 2A3 is my all-time favorite directly heated triode vacuum tube and is normally used for powering high efficiency loudspeakers. It has a pure, natural presentation with "you are there" tangible presence. Many speciality audiophile headphones including the AKG K1000, Audeze LCD-2 & LCD-3, HiFiMAN HE-5LE, HE-500 & HE-6 are lower efficiency than conventional headphones and require higher gain and power to show their true beauty. The 2A3 is my first choice for powering these challenging headphones with stunning performances. The Stratus works wonders on the Sennheiser HD800, Sony MDR-R10, beyerdynamic T1, Fostex TH900, Audio-Technica W3000ANV and numerous other audiophile headphones. DNA Stratus headphone amplifiers are proudly made in California from the finest components available. I am frequently asked why an amplifier with balanced outputs does not include balanced inputs. This is because balanced inputs are not necessary to provide balanced headphone drive. Being a single ended amplifier, all it needs for input is a single ended (unbalanced) signal. The Stratus operates single ended triode with transformer loading the plate of the 2A3 power tubes. The secondary windings on the output transformers are center tapped (and grounded for safety), thereby providing a true, differential, balanced output. Thus, you get balanced drive without the complexity from additional balanced input circuitry or input transformers. Again, the simpler - the better. 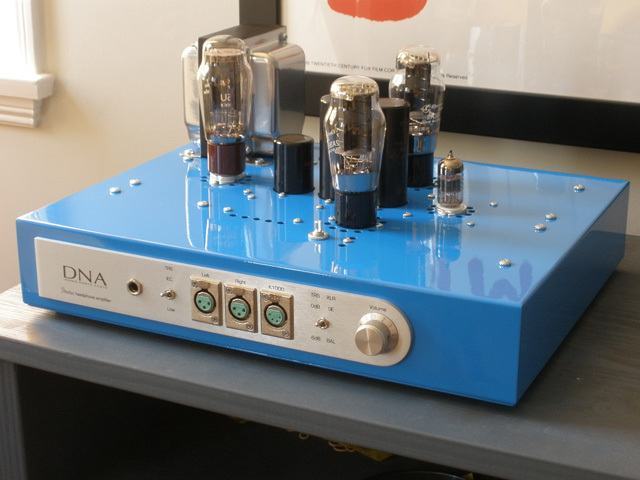 "...the Stratus is to my ears the pinnacle of tube headphone amplifiers...I have yet to find a pair of headphones that sound anything short of their best on the Stratus"
"The Stratus gives a HUGE sound and ticks all of the boxes you listed. I have about 100 hours on mine and the sound is absolutely sublime with the HD800, the best I've ever heard it sound." "I am BLOWN AWAY. I am about to drop some serious praise on your amp in the Stratus Head-fi thread. Running EML meshplates right now with the EML 5U4G as well, stock 6N1P. Already trying to figure a way to raise cash for other tubes to roll in. I have always preferred BODY and TONE to anything else and those are, to my mind, the strong points of your amp. Not that there's any loss in detail or punch, just that you've managed to make my entire body partake in the listening experience in a way that only 2-channel speaker listening has been able to do for me in the past (despite the growing collection of headphone amps you saw at my studio...) I will keep you updated as things break-in. But for now, THANK YOU for making such a fine piece of equipment and for having such fantastic ears..."
"...after it warmed up I heard a stunning level of SQ. First of all, it was dead quiet - no hum whatsoever, no hiss anywhere. And the sound? Natural timbre, palpable body and deep presence, dynamic contrasts as strong as I've ever heard with that CD, and the sound was BIG. Full-bodied from top to bottom. Every voice was a large presence - the oboes, the trumpets, the plucked strings, the timpani - all had a natural presence and a BIG presence, and I just sat back and enjoyed the music!" "Over the last 5 days I have been enjoying the amp with my Audeze LCD-2's and my Sennheiser HD-800's. Bottom line-the amp sounds fantastic with both headphones. The amp is fast, powerful, warm, rich, and big sounding. I've never heard my Audeze's convey such a big sense of space. I almost thought I was listening to my HD800's for a bit. Not only did the amp handle both headphones well, it seems to deal with all styles of music equally well. Operationally the amp is dead quiet,"
"I put in a new CD this morning, Gershwin's Rhapsody in Blue, Arthur Fiedler, Earl Wild, RCA Living Voice, and I tried the HD800 balanced on the Stratus. Wow! Gorgeous! Like listening to their original 3-track tape. Dead quiet, complete and rich timbre, intense drum whacks, golden brass, fantastic music. I had to listen to the entire piece. This is most definitely the best I have ever heard the HD800 sound. I could listen to this all day." "Through the LA7000 headphone, I hear a bit of extra bass, but it's not bloom, as it has excellent timbre and dynamic control - it's part of the signature of the D7000. In fact, the attack, tone and fade of the timpani and plucked double bass are the best I've heard." "The Stratus on the HD800 makes a gorgeous sound, with great timbre on their voices, and great punch on the kickdrum and the low bass riff. Not just toe-tappin', it's a belly-movin', get up and move rhythm!" "With the stock TRS cable, the HD800 sounds darn near the same as the RS cable. That's what the DHT SET power does. Dynamite punch and not just separate voices but all fit together in a real, you-are-there tapestry." "I think the Stratus is a different beast -- the sound quality has presence without any hint of tube bloom, and so clear I can hear the noise floor on several CDs, and even some of the overdubs and multi-track edits." "So I compared it [beyerdynamic T1] on the Stratus, and the Stratus produces all of the inner detail and natural timbre, with the added dollop of presence, of goose-bump "you are there" feeling on every note, from every voice. As santacore said, rich, full, fast and powerful, without a hint of bloom or overhang, very satisfying, gorgeous music." "I have switched over now completely for instrumental music -- the Stratus with NOS tubes is simply outstanding driving my T1 on a DHC RSC cable. Last night I enjoyed listening to Brahms 3rd Symphony with Claudio Abbado on DG - this time it was clearly a moving, stupendous performance --- crystal clear, noise-free, each section (voice) in its own location within a big soundstage, powerful (the timpani and pizzicato on the double bass were tuneful, controlled, and visceral), and the strings were liquid with incredible timbre and real resin. I could just hear someone breathe occasionally (quite close on the right in the cello or bass section), which I have never heard before on this recording, and, for the first time, I could hear the small timbral differences and place the different violin clusters in that fast fugal section in the first movement - extraordinary!! A truly wonderful headphone rig!" "Besides, I really cannot believe that I will ever hear headphone music any more beautiful than what I am listening to right now --- Emil Gilels and his daughter Elena playing Mozart's Concerto for Two Pianos and Schubert's fantastic two piano Fantasie D940 on DG --- through my Bricasti, Stratus and T1. "Like I wrote above, I am VERY happy with the SQ I have now from my M1 > Stratus > T1 using the EML 2A3-S tubes, which keep getting better. And with the Marigo Mystery Feet that Rdr. Seraphim recommended in this thread installed under every component, the SQ is better than any headphone music I have ever heard." "I'm listening to LCD-2 on my brand new Stratus and all I can say is... A-M-A-Z-I-N-G.
My previous amp was a WA3 but it just doesn't do any justice to the Audeze. Now I'm hearing what it's capable of and I can understand all the hype about them... everything is perfect, and Sade's voice is pure luxury to my ears..."
"With the new chokes and power transformer in place, the background dropped away to the point where I can no longer perceive it, and I found myself free-falling into a kind of space I had never really traveled into before. The noise floor dropped, the blacks got inkier, and the transients began exploding from a kind of depth that can only be associated with what astronauts must feel when they finally escape the earth's atmosphere and are thrust into the true deep blackness of space. The rush of notes, their crackling, scintillating emergence from an otherworldly darkness - these are my primary impressions. And since we are talking about an amp that already provided plenty of such moments, I am struggling to find words that convey that extra level of involvement in the musical event. The wet breath traveling inside a saxophone, the shifting of a violinist in his chair slightly altering the instrument's relation to the mic, the thwack of a drumstick against the metal edge of a drum in a raucous concert hall, the shimmering crash of a cymbal as it goes from its first, shattering cut into the sound-scape, then gradually trails off into a distant echo of oscillating metal -- everything is just a little bit more alive and more real than it was. And this goes for any tubes and any headphones I tried. It is in the amp. And since I know these transients and this depth are what Donald was trying to achieve, then I can only say hats off to him for a job well done." "I got 15 min to disappear from my wife's b-day party and listen to the stratus and I am floored!!! I heard this thing at a meet and I thought I was ready for what's coming but man was I mistaken. This thing really is a work of art. Thank you." "In a word the Stratus just sounds incredible! First I listened with my HE-500's, which I think are a blast to listen to. After the Stratus warmed up, I plugged in my W3000ANV's.....and haven't been able to wipe the silly grin off my face since!" "With the Stratus, I predict that headphone listening will become a much greater part of my listening habit, as so far listening on my phones through the Stratus almost seems addictive!!!" "After over half a year of listening to the Stratus, I can say that it is an absolutely fantastic piece of audio art. It has driven every headphone I've thrown at it with aplomb - AKG K1000, Audeze LCD-4 and LCD-XC, Focal Utopia, HiFiMan Susvara, Sennheiser HD 800 - you name it. I'm immensely happy with the sound. You certainly have some sort of magic up your sleeve." The DNA Stratus is sold factory direct.